Apparently this is known as the Inversion Principle, and it is the basis of sculptor John Pickering’s life’s work. An odd choice. Nevertheless, having once adopted this rule, Pickering uses it to define an entire family in excrutianing detail. And like all families there is an air of inevitability about their appearance…… the form has no choice but to come out in the wash, given the genetic base. It is the totally predictable outcome of his chosen formula. And he generally chooses to express the forms in cardboard, cut by hand from hand-calculated co-ordinates. What does this strange algebra actually define? For a man who makes 3D objects his choice of this 2D equation is strange. It means that, before he can make anything, Pickering has to make another move to map it onto the third dimension to give his pieces their mass, their volume, their shape. Only then can he, and we, consider the maths from outside, from any direction. The equation itself defines an infinite number of possibilities, but it doesn’t define all the world’s possibilities. I guess this is the attraction. The equation generates either an infinite number of points; or perhaps a line; or perhaps the area bounded by the line. Yet when we look at his work it becomes clear that he doesn’t actually represent the equation directly but instead makes a jig on which to hold the answer…..it is up to us as observers to construct the gossamer mathematical surface ourselves. They have no thickness, and he doesn’t help us by making them for us. And from this observation flows the need for another layer of structure entirely……the framework to hold the envelope. Here Pickering has been forced to be rational and to make choices…..at a practical level he has to choose only a small proportion of all the possible points and to use them as the basis for his models. But in defining the rhythm of the supporting framework he has found that he has to give his objects a Corbusian language, separating the enclosure from the structure which defines and supports it. If you discuss this with him, he recognises this and his eyes twinkle as he says “well, I wondered if they could actually be used as architecture”. Now there’s a question. And at a purely physical level, the answer has to be “yes”. I’ve seen people living in worse places. Scaled up fifty-fold, these objects would have a logical structure, with a grid or a frame which we can imagine could be made using conventional contemporary construction techniques. The pieces of card become concrete walls and floors, the gaps in the surfaces could easily be thought of as filled by glass façade panels. But as a basis for fledgling buildings, I feel Pickering’s Inversion Principle is not really so good. The sheer obstinacy of the maths removes the possibility of adaptation, of flexibility, of the human bodging that is the hallmark of trial and error design. The mutation, good or bad, has no place in Pickering’s world. Deliberate intervention cannot feature either. Gone is the chance to “add a bit here” if the volume ends up a bit mean or the building looks a bit wobbly. If Pickering tweaks one little piece, everything else has to follow the inversion principle and change too, whether it wants to or not. His only way forward is backward, to start again on another piece of work, painstaking step by painstaking step. He is the flaw in the approach, but also its richness. At this point I think of Buddhist monks…….repeating the same mantra hour after hour, day after day in an attempt to reach a state of grace. Like them, Pickering imposes on himself an absolute discipline. It is no accident that he chooses to take what seems to me like an appallingly and unnecessarily tough route through his projects…..everything is done laboriously over and over again by hand, modulating inevitably from one mathematical position to the next. It’s as if he’s playing his way through the piece, learning it as if he’s a musician. His interest in music reveals that he is in some way connecting his maths and his music together…but once the parameters are defined, each mathematical “note” is the next one in an inevitable sequence, built on its predecessor and itself defining the next part of the sequence. For a given inversion, the result is a sort of predetermined cardboard music, a little like the music boxes of old. This is not to say that they are without charm, which sometimes achieves great beauty. Many of his pieces have a flux about them, a flow, a purpose. Yet despite his very best efforts, the physical manifestation of his carefully chosen maths is marvellously impure. I like this a lot….as maths alone the answer has no impurities, but Pickering’s way of making his work introduces imperfections into the piece which, knowing the physical frailty of his hands and fingers, gives them tremendous humanity. Why doesn’t he take a shortcut and use modern technology to help him? Like humanity all through time until the last 10 years, John Pickering is a man who hasn’t discovered Excel….or perhaps he has consciously refused the delights of spreadsheet calculation with its ability to carry out the hundreds of the very calculations needed to define each of his forms. Instead, it’s an act of obstinacy bordering on self-sacrifice that he works through each repeat of the calculation by hand, hundreds of times, over and over again in a routine that you could say has become his life’s fix, his drug. How comforting to Pickering is the familiarity, the expectation, the inevitability, and the slowly unfolding flow of the numbers as they appear before him, each one calculated so laboriously, one after the other? Why else apart from addiction would he work out dimensions to an accuracy of 1mm in 10 kilometers, 10,000 times the accuracy needed for anyone, let alone a man with severe arthritis, to build these table-sized structures? Perhaps there is an answer. In the gulf between the mathematical purity of the inversion principle and the physical imperfection of the work lies the Pickering paradox. Why build anything at all? Why not just leave the work as a string of pure numbers? Here I can only guess……but I imagine that for him, there is much more to it than the numbers, and the answer will be in his psychology. I found myself asking in a cod-psychological way if he thinks of these objects as his offspring? After all, they have a prolonged labour and a difficult (virgin) birth, but in the end they see the light of day, imperfections and all, and can join Pickering in the physical world he occupies. As his health declines, he has to put ever more effort and care into each one and they become ever more precious. Eventually, as his physical frailty overtakes him, like Beethoven he will not be able to experience the music of his imaginings except in his own head. So I suspect that the importance of these pieces to him is private. He sees past the increasing hardship of the actual manufacturing process to see only the beautiful precision of the numbers. Only he has experienced what’s in there, only he has suffered in their creation, and only he sees the sublime pathos as the mathematical language is gloriously revealed no matter how imprecise the physical reality. Substance increasingly ceases to matter as long as the forms can simply exist as a framework onto which the pure numbers can be projected. So Pickering uses the shapes as the memory of his mathematical journey and an idealised physical answer, whereas we only see them as sculpture. To answer his twinkle-eyed question, I don’t believe Pickering’s forms have a direct role as “architecture”. One of the great things about humans is the way in which we adapt things to our purpose, and his work is precise and inevitable, and can’t be changed. Our whole world is full of physical lumps, bumps, holes and valleys that we carve into, build up, mine, chop down, blow up and reshape to suit ourselves. We do this with our artificial creations and buildings too. The thought of one of Pickering’s perfect imperfect forms being chopped around to fit might horrify him. It would no longer have the purity…..but then he might say that the form is just a beginning and who knows where it might take us next. There is no question that they have a strength that comes from the rigour of the mathematical process involved in their conception and birth. At the same time they suffer from their rigour. To me, they are sometimes beautiful infants but always still-born. I can only see them as the starting point for the next attempt. And there can’t be too many of these…given the way he works, his life will be too short to explore very many of the infinite possibilities. However, one thing you can say about Pickering’s work is that it could actually be built. As an engineer, I like the rationale of its manufacture. It’s a counterpoint to those who doodle away in 3D Studio without a second thought about the practicality of their computerised forms. If, like them, you can draw whatever shape you like, it either stays on a computer screen or something has to give somewhere. 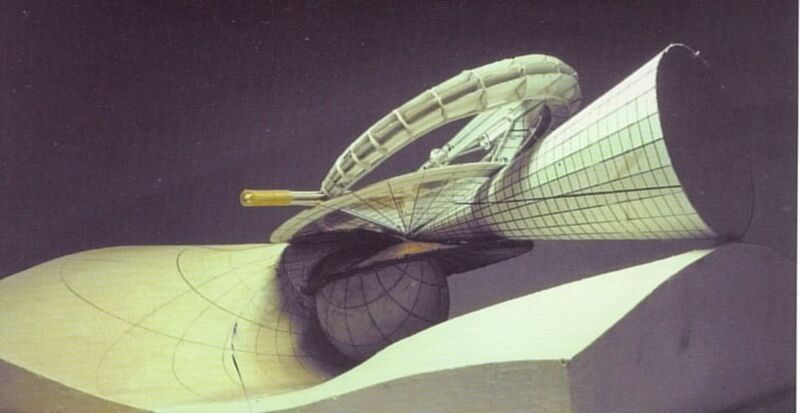 Either manufacturers develop techniques to enable them to actually build these free forms, or the 3D Studio jocks allow reality to constrain them. Personally, I hope the manufacturers rise to the challenge, and the advent of cadcam means that we are on the first steps of that journey. Not that John Pickering seems to have noticed or to worry too much about that. He is on another journey. But there is a fundamental contradiction in attempting to use his favourite equation for something like “architecture”. This is because the inversion principle is the equation of a weightless structure. Put it on earth and the pure maths no longer applies. From this we can conclude that the proper place for Pickering’s work is not on this world, but in the weightlessness of space. This observation can also be levelled at the vogueish architecture of mathematical idealisations with whom Pickering’s work might be compared. 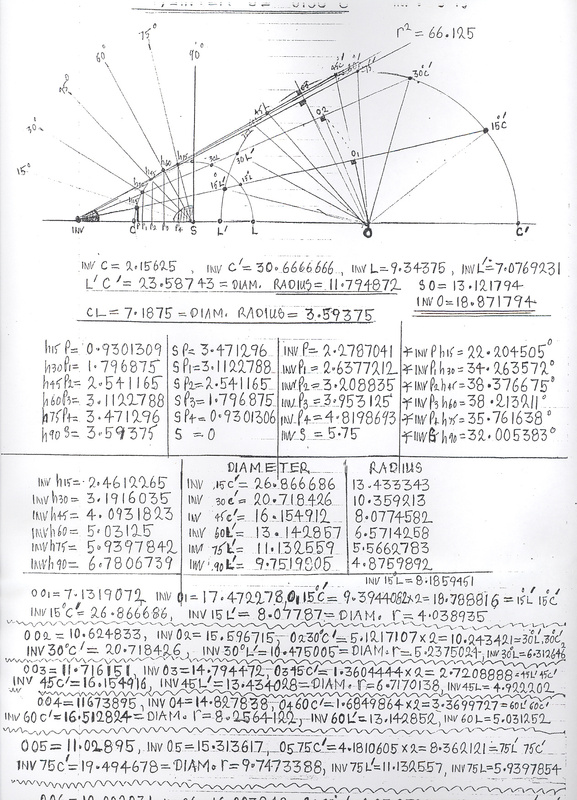 Put these mathematical forms on earth and another mathematical “operator” comes into play…namely gravity. This pulls the lines of pure mathematical flux inevitably towards the ground. That’s why we respond so well to arches, parabolas, catenaries, shells and nets. Cathedral designers knew this very well, and memorably designed their forms to respond to the flow. Ignore this and risk forcing an alien answer onto our natural planet. His work evokes shells, ripples, and shock waves that would be equally at home under water, especially if they were made from something with a density of 1 tonne per cubic metre. Perhaps this explains the sea-bed-like language of the forms that spring from the maths……. to live happily on the earth, Pickering’s forms would be forced to thicken, shift, respond and compromise to the natural forces acting upon them. Would I like to live in a Pickering creation? Only if you took away my backbone and turned me into jelly. Which is why I feel uncomfortable about the current fad for biomorphic forms….responding to a completely different set of non-human drivers that may be familiar to echinoderms but not to homo sapiens. Yes they look great, and the spiral of a Nautilus shell has a poetry of its own but that doesn’t meant it’s any better for us to live in than a box. In fact, for humans, it’s worse from the functional point of view given that both our legs are the same length. Developing that theme one step takes us to an architectural language for humans that has flat or nearly flat surfaces (to walk on), but much more freedom in the rest of the enclosure. Now why didn’t we think of that before? So the mathematical forms don’t do it for me unless they are sheared through by great anarchic shards of floor in which case there might be something mad and great to be found. It’s difficult to park in an empty carpark. In choosing the inversion principle as his very own parking space, John Pickering has put intuitive art and freedom of choice aside in favour of a “highly liberating” precision. In his work he is partly an engineer……he changes the world to hold the product of his ideas. He is also a mathematician..…and an ascetic. And he is a constructor of ideas whose mathematical purity can never be given physical form. How he copes with this in the face of his increasing arthritis I cannot imagine, but the remarkable thing is that he does. And he makes me want to know who’s going to park in the next space. If I could choose who it would be, I would want someone to weld, graft, or mind-meld what Pickering does to those happily bashing out Telly-tubby shapes in the name of architecture.